As we prepare for the annual Faith In Action campaign, I’ve been asked by the full-time ministers of the Diocese of Juneau to provide two bulletin inserts in preparation for the formal start of this annual Diocesan drive. In doing so, I would like to propose a new way of considering how we generously give. While this is not new to Christians worldwide, it may be a new challenge for a number of people in our parishes. I’m proposing the act of tithing. Although tithing may not yet be the practice of many in our Catholic community, I ask for your prayerful consideration. When I first arrived in Alaska, I learned that each year every Alaskan resident received a Permanent Fund Dividend check which comes from the oil royalties paid to the state. As you can imagine, I was quite surprised that every man, woman and child received this wonderful blessing. Over the past years, I have given much reflection to our response to such blessings. In the beginning when God created the heavens and the earth, he created humans and entrusted all of creation to them. Our nation and our state prosper from tremendous natural resources. But God did not give us these blessings to stockpile. He gave them to us to share with others. That’s the nature of stewardship: sharing. Each year as we receive our Permanent Fund Dividend check, we are mindful that this annual blessing is a result of God’s abundant creation. It is in gratitude to our Creator that we offer our prayers of thanksgiving for the many blessings bestowed upon us. It is in the spirit of gratitude for the abundant blessings God has bestowed upon us that I ask you not only to consider offering your time and talent, but also to offer a percentage of your Permanent Fund Dividend check to the good work of the Church – the Body of Christ. It is the work of this Diocese to provide for the sacramental life of our people within our larger parishes as well as in our smallest missions. We all have a part to play in advancing the Gospel message and the mission of the Church. Your contribution to the work of the Diocese is vital. As you prayerfully consider how you can help the work of the local church with a percentage of your PFD, allow me to offer some suggestions in approaching this year’s Faith In Action campaign. First of all, our gratitude to God must be expressed through prayer. It is essential that we give thanks for the blessings God has bestowed upon us and to return our offerings to the Lord. Each time we celebrate the Eucharist, a name which means “thanksgiving,” we bring to the altar our offerings of bread and wine and our monetary offerings for the support of the Church and of the poor. We pray that our offering may be received by God as coming from hearts grateful for the blessings we have received. Secondly, offering a percentage of our first fruits to the Lord, also known as tithing, has its basis in Scripture. It is Jesus who speaks of the good steward, one who is entrusted with the management of property, finances, and other affairs not his or her own. This is to say, our gifts of time, talents, and treasures are not really ours, but rather on loan to us to manage. All that we have comes from God. To give back to God a share of our blessings is a proper way to participate in the work of the Kingdom of Heaven. Thirdly, I ask that we look at the receiving of our Permanent Fund Dividend check as a true blessing and a share of God’s creation. 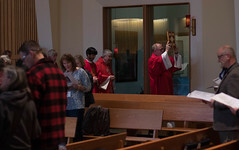 Allow me to suggest that a percentage of this dividend be presented for the work of the Kingdom of Heaven through the diocesan ministry and the ministry of our missions and parishes in Southeast Alaska. I invite adults to tithe 10% of this year’s PFD amount, and the very young to 18 years of age consider tithing 5%, recognizing that children have current and future needs. It is my hope that parents will be able to speak to their children about the responsibility to share what God has given them with the Church and the poor. We also encourage our children to contribute to the Sunday offertory collection—a sacrificial gift back to the Lord. I propose the tithing of our PFD as a basic minimum of giving for the Faith In Action campaign. For those who are able to offer more, I urge you to give generously to advance the work of this Diocese. 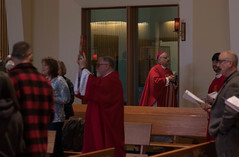 For it is in giving that we demonstrate concretely our thanks to God for his blessings, participate in the work of his kingdom, and share together the fruitfulness of being the Catholic Church in Southeast Alaska. I will speak more of this type of sacrificial giving as the Faith In Action campaign unfolds and as the Year of Faith approaches. In the meantime, please know that you and your loved ones are in my prayers.